So Friday had finally arrived. Tomas and Angel had already left that morning for Bilbao. Me being the pringado, I was stuck in Madrid having to work. But as soon as that final bell rang, I ran to the bus stop, picked up the first bus that came by (and by luck was the one that goes to the airport), went to the airport, and caught my flight to meet up with my friends. Upon arrival, I was immediately given the feeling that I had returned to my favorite part of Spain, Galicia because it was raining and the scenery was so green. I quickly decided that maybe it’s not just Galicia that I love, but rather the north of Spain. However, after you enter Bilbao, you realize that although the surroundings might be similar, they are very not similar. Bilbao is the economic capital (the real one is Vittoria, this was just pointed out to me) of Pais Vasco (or Basque Country) which is a region of Spain I’ve wanted to visit for a long time. It’s a place that speaks the supposed oldest language in Europe and has no relationship to any other language in the world. It’s completely unique and that makes the people there very proud. Up until just recently, there was a separatist, nationalistic, terrorist organization called ETA which basically controlled the entire region (maybe sort of like the Mafia in southern Italy.) Now, you can see Basque flags flying in every window and in the doorways of every shop. However, you shouldn’t have the impression that it’s a highly political, radical, and dangerous place. In fact, it’s very tranquilo, the food is wonderful, and although Bilbao is a pretty commercial city, the Old Quarter certainly has its very own special charm. Since Tom and Angel had already seen most of the small city, when I got there, we just decided to wander a little more. 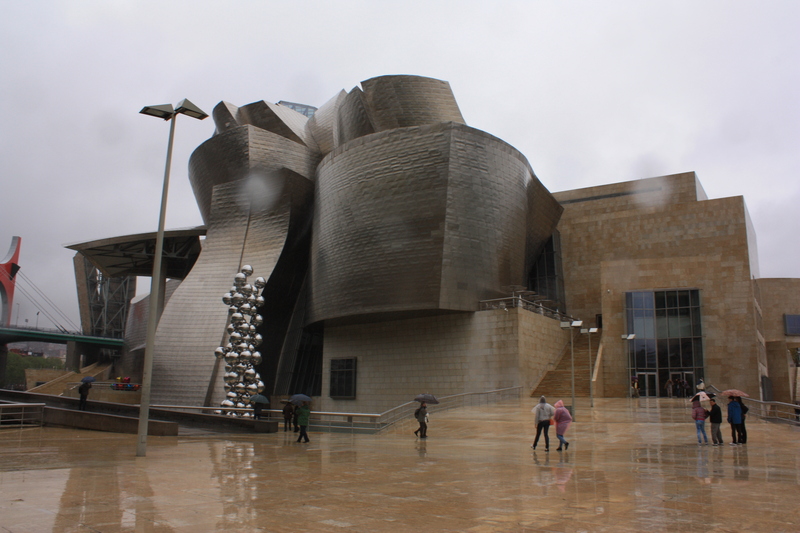 We made it down to the Guggenheim Museum, which is the one thing I really wanted to see in Bilbao. We didn’t go inside, we were saving it for Saturday, but the architecture is really quite impressive. There we met two American girls who were also auxiliares. We ended up grabbing a few beers with them and then wandered around with their hosts from couchsurfing, who were two real friendly Spanish guys. Later, we returned to our hostel, changed and got ready for the night, and went out. However, our timing was poor because the previous night, the football team from Bilbao, Athletic Club of Bilbao, had won a huge match and I guess the whole city erupted into a mad party. So Friday night came around and the entire city was dead. We wandered and went into a few places, but even the most crowded place was nothing more than a hallow bar with loud music. Eventually, we retreated and just went home. We got up Saturday morning, checked out of our hostel, went and saw the Guggenheim, this time from the inside, and then we caught the hour and ten minute train to San Sebastian. We walked to our hostel, still in the rain, checked in, then took to exploring the city a bit. We met up with some girl from New Zealand that Tom and Angel had met before I arrived in Bilbao. Together, we all went and ate pintxos, which are Basque tapas and are over-priced, but delicious. Later, we took a break back at our hostel, met some cool kid from Florida and about 10 French women who were celebrating a bachelorette party, and then after we had all solidly pre-gamed in the hostel, we went out. We ended up going to some place that was unfortunately littered with alpha-male jerks from France who started a fight with us. One of the guys was good and drunk, and you could tell he had that real Neanderthal mentality where when anyone that looks at him funny needed to be hit. So he was staring at me, and I said, “Hey, what’s up, man,” in a friendly tone. And me being the nice guy I am, clearly I need to be beaten upon like a punching bag. So in his efforts to get out his aggravation from meeting such a handsome and friendly American lad, this rugby-type macho douche bag decided he would return my nice salutation by grabbing my throat and choking me. Fortunately, I’m a P.E. teacher so I’m pretty buff these days and ripped off his hand like the Hulk tearing off his clothes. Then he randomly decided that Tom, who was standing right next to me, was such an outstanding guy too that he started after him, and then began kicking that American kid from Florida. The kid from Florida said, “Don’t start, man,” and he had the look in his eyes like he had played college football for the Florida Gators and was about to show him what American might is all about. Tom was thrown back by some other guys in the bar, and fortunately, the big baboon was held back by his friends, but he kept at it. Out of nowhere, some random idiot dressed in a rat suit started punching Tom, and since I was right there, I grabbed the moron, pulled him off Tom, and then we were all thrown out. As we were standing outside, we heard threats that the police had been called. We were stared at in the street by these aggressive meat-head mongoloids, but nothing else happened. Eventually, we were all super pissed that these shallow, drunk assholes had ruined our fun night, we went home. None of us even threw a punch or retaliated in anyway and no one was hurt except for Angel, because he stepped on some glass it went through his shoe. Other than that, not a scratch. The following day, we woke up going, “What the heck was that all about?” and we laughed off the stupid events of the previous night. Eventually, we got out of bed, had an amazing lunch, then wandered a bit more before I had to go back to Bilbao to catch a flight to Barcelona. Unfortunately for me, I had to leave my friends and two more days of fun in San Sebastian to visit the university I will most likely be attending next year. The school had accepted me but they wanted a 1000 euro matriculation payment so obviously I wanted to see what the school was all about before I started throwing money into it. I went back to Michelle’s flat, found her awake so we went for a little stroll through the city and grabbed some cañas to finish off my super short trip. Then around 3 in the afternoon, I went back to the Barcelona airport and came back home to Madrid where I now have two days to just sit back and relax. Thank goodness for five day weekends. Basically, I took three trips this weekend, and each lasted exactly 24-hours. It was short-lived but worth every second (except for maybe our skirmish with those short-brained hooligans from France). As always, I had a complete blast with my two and only American buddies, Tomas and Angel. Those guys are so much fun; I don’t stop laughing when I’m with them. It’s nice to have such awesome friends out here. The best thing that came of this is that I got some of my priorities out of the way and Barcelona now just feels like the right decision and I’m really looking forward to starting my Master’s degree there this September. Graham, where are you planning on studying? I’m waiting on the second fase for the UAB for an online masters in PR. Enough of this teaching business! And, did you know that bilbao is not the actual capital of the PV? Socially and economically, yes, but it’s actually Vittoria! Truth! Graham, I feel like I haven’t heard from you in a while. I’m glad to hear a bit about your plans. :) If you’re in or around Madrid next year, we must meet up! I love your photos and that you get to see the world! But I hate bleep, bleep, bullies! Please be careful.